It happens day after day at dealerships across America. Prospects walk through your doors, look around, and kick tires. You know you only have 72 hours to make the sale or you've lost them. But the sad thing is, you may have lost them the second they walked into your showroom. Maybe a prospect heard your low-low price radio spot, saw your big bargain newspaper ad, or was intrigued by your zero-percent financing television spot. Word-of-mouth advertising from satisfied customers may get new prospects to check out your dealership. It’s even possible that the direct mail postcard featuring below factory invoice pricing could bring people in by the dozens. But whatever form of advertising or promotion you use to attract prospects to your dealership, it isn’t enough to keep prospects on the premises-nor is it enough to make them want to buy immediately. Because advertising and promotions don’t make the sale - your salespeople do. That’s why it’s critical to create the right type of buying environment at your dealership - a visual signal that tells prospects, you've come at the right time and you’re getting a terrific deal. If you don’t buy today, you’re missing out! And, that’s why a growing number of dealers are turning to cost-effective promotional sales events kits. Unfortunately, the look of many show rooms during special promotions is the same as it is most other days. A sales person at a Baton Rouge, LA dealership said, we advertise in the papers and on TV like crazy to boost traffic, then the customers come in and, boom! There’s no excitement on the floor - it’s just another ho-hum day at the dealership. If people don’t see anything different, if they don’t feel there’s anything special going on, they’re going away. You have to convince them at the point of sale that there is something cool happening and they’re benefiting from it. You've got to walk the talk. Short-term sales event kits help dealers to do just that. Sales event kits are an effective way for dealers to dress up their facilities and create a festive, customer-friendly atmosphere that puts prospects in the right frame of mind to buy. The kits, which usually cost in the range of $1,000, feature a complete array of coordinated promotional materials that help to transform showroom floors and lots into a selling showcase. Sales event kits, which are theme-based to reflect various holidays, celebrations, and seasons throughout the year, include everything from colorful, eye-catching banners, posters, pennants, and balloons to hang tags, pens and post cards. Dealers choose from a wide range of pre-packaged themes that suit their sales cycles and can order as many kits as they need. 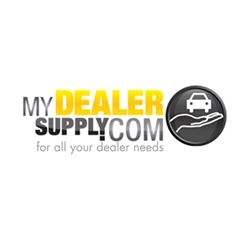 MyDealerSupply.com sales event kits can be found on the Internet and they will ship kits directly to your dealership a few days in advance of your planned promotion. According to one Texas dealer who runs several GMC franchises, "sales events are exceptionally good for business. It’s amazing how jazzing up your showrooms, cars, and lots not only generates traffic but increases conversion rates! Sales events give us a much better return on our investment than the money we spend on advertising. Experts claim that, on average, a three or four-day event can easily produce a 10 to 20 percent bump in sales and gross profits." "Sales kits keep my customers happy and make money for my sales people, so they’re pleased as well. Everyone gets into the act and has fun," the GMC dealer continues. "It creates a win-win situation all around. The way you present your dealership, the way you make it stand out visually truly makes a difference when it comes to writing orders." Bottom line: Sales event kits are an inexpensive way to boost profits. Developing an exciting atmosphere at the point of sale to encourage immediate purchase is smart. And it’s even smarter when the sales kit doesn't cost an arm and a leg, and is just a click away from your dealership.